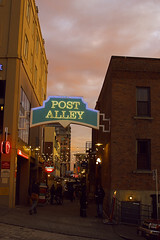 Opinion: “Post Alley” or empty lot? 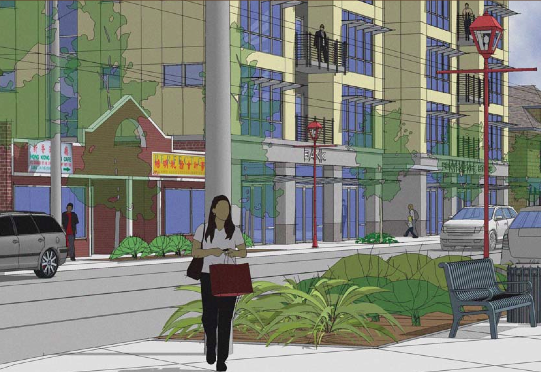 Possible development on Beacon Avenue, depicted in the Neighborhood Plan Update. 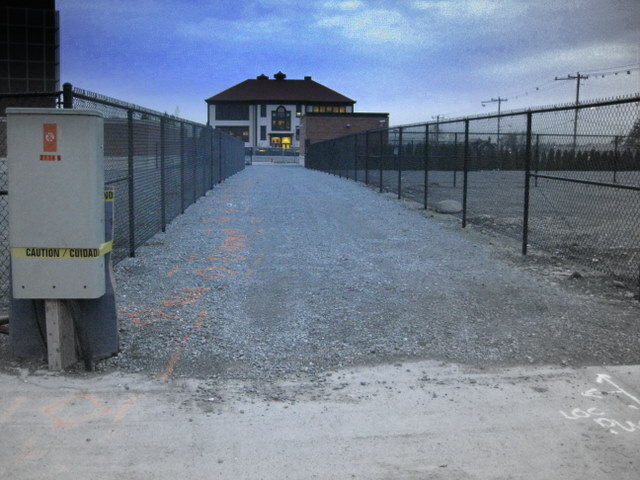 Are you tired of looking at gravel lots surrounded by wire fencing next to the Beacon Hill Light Rail station? Do you dream of potential businesses that would be perfect for our community? The comments on Joel’s post “Beacon Hill’s Post Alley” indicate community support for development around the light rail station. For any development to occur, the North Beacon Hill Neighborhood Plan Update must be approved. That plan is being challenged. A community member has filed a petition with the City of Seattle Hearing Examiner (see the earlier news post in the BHB) calling the update process into question and requesting that the DNS (Determination of Nonsignificance) be vacated. Concerns listed in the petition include construction noise, increased traffic, lack of specific guarantees regarding service improvements, and overall disregard for community opinion and the existing neighborhood plan. Simply put, it’s a request for DPD to be required to throw away over a year’s worth of community input and other work on this project—essentially starting the entire process over. Neighborhood, City and transit groups have worked hard to update the North Beacon Hill Neighborhood Plan in a way that respects the core values of our community and includes the reality of introducing mass transit into the neighborhood. Two critical considerations for an urban neighborhood served by mass transit include increased residential density accompanied by increased employment, service, and other business development. Increased density is a worthy goal for our neighborhood: people should live and work near transit. We need housing, employment, and services for our future neighbors. This doesn’t have to/shouldn’t mean increased vehicle traffic—the entire point is that new residents will be using light rail. If the North Beacon Hill Urban Village is ever to develop, we must move forward as a community. Change can be challenging, but it’s also an opportunity to improve. Get involved. Learn more about this issue and take action to make Beacon Hill the place you want it to be. Please attend the North Beacon Hill Council meeting on Thursday, February 4 at 7:00 pm. Meetings are held at the Beacon Hill Public Library. The full agenda is here and also here. People’s Place is a new homeless advocacy organization combining community support with professional advocacy to help chronically homeless people become stable. We are hosting a fundraiser and information session at El Centro de la Raza, 2524 16th Avenue South, tonight from 6:30 – 8:00 pm. Auction items include arts and crafts created by our members, as well as packages that include a chance to spend time with local political figures—have lunch with Mike McGinn, go for a bike ride with Mike O’Brien, or enjoy drinks with Pete Holmes. All proceeds go directly to shelter costs for People’s Place members. Contributions are tax deductible. Light snacks, good company, great cause—what better way to spend a Friday night on Beacon Hill? The suggested donation is $35 at the door. For more information, see the People’s Place Facebook page or email peoplesplace@yahoo.com. If you can’t make it to the event, please consider making a donation using the PayPal link. Thanks! Have you checked out the North Beacon Hill Neighborhood Plan Update? In case you’re new to North Beacon Hill, this is the draft document generated out of hours of meetings with the City of Seattle Department of Planning and Development (DPD). The North Beacon Hill Neighborhood Council and many individuals have worked very hard to collect input and share neighborhood opinions about how our community (“urban village”) should look. 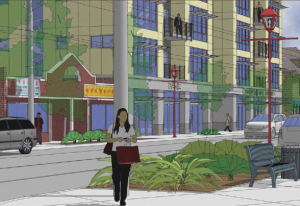 Perhaps the biggest change proposed in this draft is increasing the height limit of buildings surrounding the light rail station. 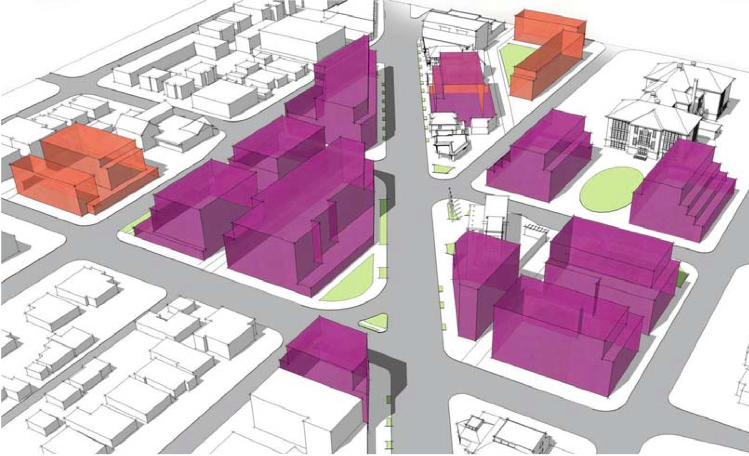 There’s also a proposal to update El Centro de la Raza’s zoning. It’s currently single family residential—no, I’m not joking. In case you’re unfamiliar with El Centro, there are dozens of programs operating out of that building, serving thousands of people of all ages and from all backgrounds. Childcare, senior meals, homeless services, a food bank, immigrant advocacy, and more. There are also businesses operating within El Centro: CommuniChi acupuncture, Excelsior Travel Agency, and others. For a complete list and to learn how to volunteer or make a donation to El Centro, visit their website. El Centro hopes to develop affordable housing and expand their program facilities. This is an incredible opportunity for our entire neighborhood. One potential future for North Beacon Hill (looking north on Beacon Avenue, near McClellan). Many people have concerns and fears about changes to our neighborhood, especially around the idea of increasing density. What’s important to you? What makes Beacon Hill a place you want to live? What would you change? I’m concerned about preserving the character of our neighborhood and encouraging good design. I want to keep what we have (Red Apple, Baja Bistro, La Cabaña, etc.) and add businesses that serve our community (a bookstore, a consignment store). I want to preserve the charm of our single family blocks and add dense, affordable housing near the station. I want our sidewalks and crosswalks accessible to the seniors who’ve lived here for decades and to those of us pushing strollers through the neighborhood. We’re expecting another human member of the family in May. I’m excited to see baby/kid-friendly businesses opening in our neighborhood. We always assumed we’d send our kid to the neighborhood school, and were content with Beacon Elementary and Kimball as choices. The Seattle School District is shifting to location-based school assignment, which will (hopefully) mean that our south-end schools start achieving parity with the rest of the city. Change can be challenging. For some perspective on all the changes in Beacon Hill over the last 100 years or so, check out Seattle’s Beacon Hill by Frederica Merrell and Mira Latoszek. (Merrell is an occasional contributor to the BHB. — ed.) The book is chock-full of photos from the Jackson Regrade—when neighborhood planning meant washing huge portions of the city down into the Sound! Now is our chance to shape our community for decades to come. Get informed; get involved. Attend meetings (the North Beacon Hill Council meets on the first Thursday of every month at the library) and talk to your neighbors. 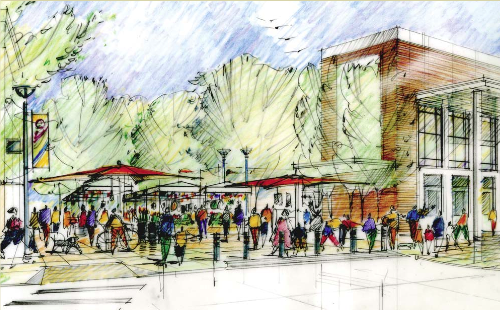 An artist's depiction of a future event at the Lander Festival Street, from the North Beacon Hill neighborhood plan update. 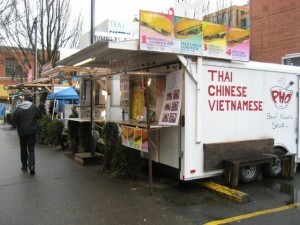 Food stands in Portland; could we have this here? Photo by Joel Lee. 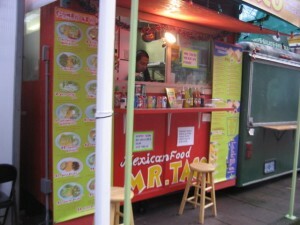 I’ve always admired Portland’s funky attitude towards street food vendors. What was years ago a smattering of taco trucks and falafel vendors, has grown into entire streets filled with every imaginable variety of food being served from every imaginable type of food wagon. Working in downtown Portland means having your choice between dozens of street vendors during lunchtime. Since returning from my recent trip to Portland I’ve been dreaming of seeing more of this in Seattle. Besides my own selfish desires for more food selection, it’s also a perfect building block for a strong local economy. It does not take nearly as much money to start up a food cart as it would to open a restaurant, and it does not involve nearly as much risk—these types of small businesses are the front lines in a recovering economy. I would love it if the area around our light rail station would develop into an area where street vendors would become more welcome and small business entrepreneurs would be given the time, community support, and space to try new types of businesses. As an added bonus this would give us a multi-ethnic gathering place, build community, and enliven ‘downtown’ Beacon Hill. Another Portland food stand. Photo by Joel. Neighbors walking their dogs can be helpful as a crime watch force in the neighborhood. Photo by melanie b. Like most of you, I’ve been following the posts and news stories about break-ins, robberies, car prowls, and other crimes in and around our neighborhood. One of our close neighbors had their car window smashed in a few weeks ago—and none of us heard a thing. I try to balance between wariness and paranoia, common sense and complacency. Mostly, I try to focus on what I can do to keep our community as safe as possible. Inform your immediate neighbors that you’re going to be gone and ask them to keep an eye on your car and the exterior of your house. Lock everything—windows, doors, sheds/garages, cars. Leave keys (house and car) with at least one trusted neighbor, along with local emergency contacts and a way to reach you while you’re gone. For short trips, ask someone to check your mail—just so that there’s foot traffic up and down your porch and to prevent possible mail/identity theft. Ask someone to brush leaves/snow off your car or to keep an eye on your garage. For longer trips, either put a hold on mail and paper delivery or ask someone to pick up daily (same with the promotional materials people leave on doorknobs, yellow page books, and other deliveries). Keep things normal: consider putting a couple of lamps on a timer; if you have holiday lights or use exterior lights, put them on a timer, too; ask someone to bring trash/recycle/yard waste cans to the curb and back. If you’re planning to be away for more than a few days, consider asking someone to come in and check on your house. There are some very responsible teenagers in our neighborhood. Find someone you trust to stay in your house. Check references and have your neighbors check in on this person. If you have pets, you’ll need to take them into consideration as well; these tips are for property safety only. Special considerations for pets: let your vet know you’re traveling and leave a check or credit card number with them in case of emergency; make sure your pet-sitter has access to travel carriers and driving directions to the emergency clinic; keep copies of pet license numbers and/or microchip numbers current. Our entire community is safer when we get to know each other. Offer to help your neighbors, and ask for help. Bring in the trash cans for an elderly neighbor, deliver cookies to a newcomer, and talk to people when you see them outside. If you see something suspicious or have concerns, share them—not just with the neighborhood mailing list or the blog, but with the household involved. Those of us with dogs spend a lot more time on the sidewalk than most people—especially now that it’s dark earlier and the weather isn’t welcoming for an after-dinner stroll. Tica and I are both very aware of the patterns of our neighborhood: what kind of cars people drive, when folks are home, new neighbors… and of course, who has dogs and what time they’re out. We know most of the regulars out walking at various times. I feel like I could reliably identify someone who was out of place, and I’m confident I would notice someone suspicious loading your TV into a van. Tica and I are a great team to enlist for help watching your house. Your block probably has a few dogs out every night for a constitutional—do you know them? They’re potential allies. The missing piece is knowing how to reach you if there is a problem. Does your next door neighbor have a cell number for you while you’re on vacation? Wishing everyone a safe, warm winter—at home or away! The status of Beacon Hill for the next few months is likely to be something like this -- rainy. Photo by Bridget Christian in the Beacon Hill Blog photo pool on Flickr. It occurred to me this week we should put together a status report on our neighborhood issues, projects and forums, for Mayor-Elect McGinn. Here is a draft. I came up with a bunch of categories that we could write short summaries on. Some stuff we could pull right off the Blog. Volunteers? Take a topic and write a short summary as a comment to this blog post. As I see them posted, I will compile into one doc. I will post the results and we can hand it out to our Mayor-Elect at the upcoming forums and also distribute to new council members. If this format works, we could do an annual or biannual report. North Beacon is an active and articulate residential community. North Beacon Hill pioneered urban village planning in 1990 (North Beacon Hill Action Plan), before the City initiated the 1998 planning cycle. We are currently working on recommendations for our third neighborhood plan and have numerous other planning documents completed. Urban Agriculture Project: Designed for Jefferson Park by local permaculture students. BHIS students welcomed the community in many languages at last year's Opening Ceremony. Photo by Bridget Christian. My son is a first grader at Beacon Hill International School. It’s a dream come true for us, and we felt very lucky that though it was not our reference area school (we live 1.8 miles north of the school), after a month on the waiting list he got in. We were doubly happy that our son’s little brother will be able to join his big brother at BHIS in a few years. Though I had heard rumblings about a change in the school assignment system, I had no information about it until I saw a posting on Madrona Moms last spring. The new Student Assignment Plan, evidently years in development, quietly eliminated the sibling priority for enrollment. The plan to make the schools neighborhood schools would break up thousands of SPS families into two different elementary schools, or would force families to pull their older child out of his or her school to be able to attend the neighborhood school with the incoming kindergartener. We have been trying to get the word out at our school. It’s greatly complicated by the diversity of languages at students’ homes. Only about half of the students’ families speak English at home. My husband got letters to the school board translated into Mandarin and Spanish, and families from those cultures signed them. Our school’s principal pointed out that over the years many Beacon Hill Elementary School families from outside the reference area chose the school because of its strong support for English language learners. In June, the School Board voted to approve the new Student Assignment Plan. But, due entirely to the growing outcry by parents, they addressed the question of grandfathering in younger siblings of currently enrolled students by promising to consider a transition plan this fall, after the new boundaries are released and voted on. Sign The Friends of the Seattle Public Library‘s Facebook petition to preserve library hours at the Beacon Hill branch. 1pm to 8pm Mondays and Tuesdays. 11am to 6pm Wednesdays and Thursdays. 11 am to 6pm Saturdays. More information about the 2010 Proposed Budget’s effect on the Operations Budget (collections and hours) and Capital (major building maintenance) is available on The Seattle Public Library’s website. The Friends of the SPL want to hit 2000 signers on the petition today. It’s not out of reach at 1483 petitioners so far. Add your signature here. 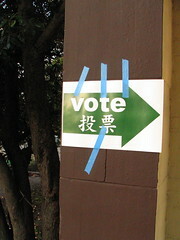 "Vote" sign at El Centro, November 2008. Photo by Wendi. Leaves are starting to turn and clouds are staying around for days instead of hours. There’s that certain crispness in the air and football on TV (Go, Pack, Go!). It must be election season. Tica and I have been walking the blocks of North Beacon Hill since 2003. We’ve watched election signs go up for Kerry, Bush, Rossi, Gregoire, Obama, McCain, Rossi, Gregoire… plus the monorail, levies, school board elections, parks, and more. This year, there just isn’t the same showing–for any issue or any candidate. Where are the yard signs? Is it too early in the season? Are candidates not producing them in the same way? It can’t be that Beacon Hill has become less interested in politics. The 36th District is active, engaged, smart and passionate. Both Democrats and Republicans in Beacon Hill vote. Candidates are falling over themselves to attend and organize forums, townhalls, and walks in Beacon Hill and other parts of Southeast Seattle. The City is working on a Neighborhood Plan to decide how high buildings in the Beacon Hill “urban village” will be. There are changes proposed to improve the safety of cyclists on our streets. I know our neighbors have opinions–get involved! Attend meetings if you can, read up on the issues if you can’t, and talk to your neighbors. Most importantly, register to vote and confirm that your ballot is on track to be mailed to your current address. All voting is by mail in Seattle. Go to My Vote to be sure that you’re going to get your ballot. Do you have a new roommate or neighbor? Do you know someone who just turned 18? Monday October 5th (today!) is the last day to register or change your address online. If you have never registered in Washington, you have until October 26th to register in person. We have several important choices on the ballot this November. There are two new candidates for Mayor: Mike McGinn and Joe Mallahan. We’re choosing between several City Council candidates AND there’s a race for City Attorney and King County Executive. We are also voting on two statewide initiatives that could have lasting impact: I-1033 (a Tim Eyman initative) and R-71, a referendum to roll back approve or reject domestic partnership benefits. Learn about the candidates and their values. Understand the implications of the initiatives. Vote. That’s even more important than yard signs.